The police headquarters in Abuja yesterday paraded a 43-year-old man for allegedly threatening former Vice President Atiku Abubakar to either withdraw from the 2019 presidential race or have his plane blown up mid-air. 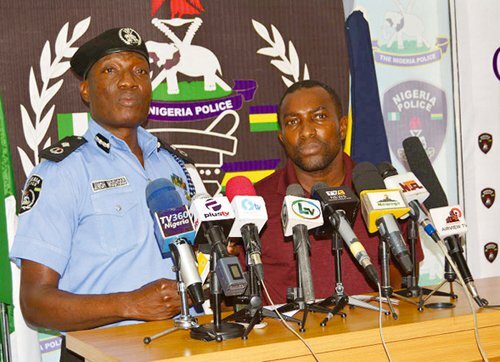 Police spokesman Jimoh Moshood, an Acting Deputy Commissioner of Police (DCP), said Augustus Akpan allegedly used a stolen phone to threaten the wife and daughters of the former Vice President with r*pe. Akpan, who hails from Edemaya village in Ikot Abasi Local Government Area of Akwa Ibom State, was reportedly arrested while fleeing to Lagos. He was also said to have extorted huge sums of Nigerian money and foreign currencies from unnamed high profile citizens with false claims of being an operative of the United States of America’s (U.S.A’s) Central Intelligence Agency (CIA) and Federal Bureau of Investigations (FBI). Moshood also said the suspect, who speaks fluent English, Ibibio, Russian and Portuguese languages, will remain in their custody until investigations are concluded and he is arraigned in court. He added: “On the receipt of a complaint of threat and intimidation from former Vice President Atiku Abubakar, 43-year-old Augustus Akpan was trailed and eventually arrested by the IGP Intelligence Response Team. “Akpan was arrested at the toll plaza on Lagos-Ibadan Expressway in Lagos State while he was on the run to escape arrest. During interrogation, he confessed to the crime and admitted that he resorted to the threat and intimidation when efforts to extort money from the former Vice President were unsuccessful. “The suspect also admitted in his confessional statement that he is a professional fraudster and not working for any party. He said his mention that ‘Let Buhari run against your against your PDP members’ in his threat message to the former Vice President was merely to divert attention. “The suspect is fluent in English, Ibibio, Russian and Portuguese languages. The phone and the subscriber identification module (SIM) card he used for the threat and intimidation were recovered from him and were discovered to have been stolen from a lady who identified him as the person who robbed her few months back.